Hundreds of mom-and-pop-owned stores once dotted the neighborhoods of Indianapolis and urban planners increasingly question if that was such a bad thing. Before zoning laws restricted businesses in residential neighborhoods, small stores such as groceries, hardware stores, shoe repair shops, and restaurants were sprinkled among houses and their proprietors often lived in quarters behind or attached to the the shop. 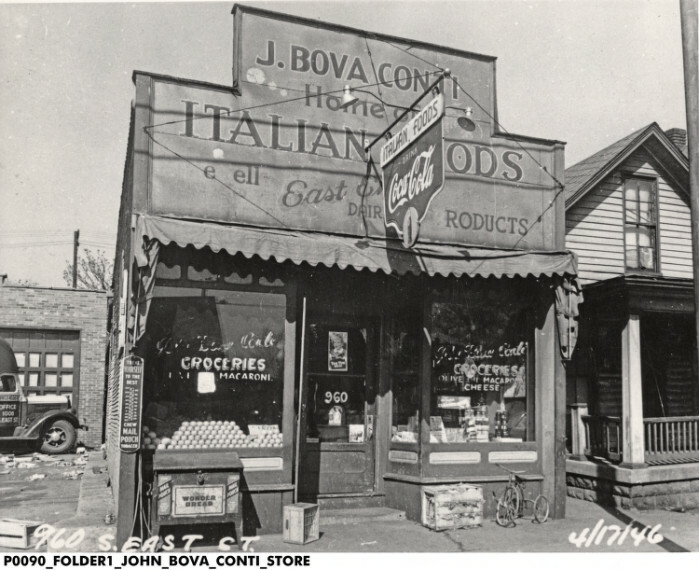 One such store was the J. Bova Conti Grocery, which served Indianapolis’s small Italian community on the near south side from the 1920s through the 1950s. Italian immigrants John Bova Conti and his wife Josie operated the J. Bova Conti Grocery at 960 S. East Street. According to Indianapolis Italians by James J. Divita (Arcadia Publishing, 2006), Josephine Mascari and her son Tommaso were having hardships with their grocery on Virginia Avenue and the well-educated and popular John Bova Conti (1877-1937) moved in to run the store and ended up marrying the widow. It was not until the 1920s that they rented this small, wood-frame grocery with an adjacent residence. Signs on the store and visible goods include Wonder and Yum Yum bread, fruit, macaroni, olives, cheese, Coca-Cola, and East End Dairy products. The store’s business ledger for 1924 through 1927 (housed at the Indiana Historical Society) indicates that many products were imported from Italy and distributed to other stores around the state. According to Divita “After visiting relatives in Indianapolis, customers from smaller towns would stop at Bova Conti’s to buy 20 pounds of dry pasta for the month. Among his attractive prices were one gallon Berio olive oil, $3; one bottle, Florio Marsala, $2.25; five pounds, Sicilian caciocavallo, $3.75; and one case Brioschi, 75 cents.” By the time these photographs were taken in April 1946, the store’s namesake had been deceased for several years. Gus Mascari recalls that his grandparents Tom and Marie Mascari operated the grocery from the late 1930s through the late 1950s. Another Mascari grandchild, Mrs. Terry Shannon, shares that the store had sawdust on the floor and pickles in large barrels. They sold Italian bread baked by Mrs. Mascari. 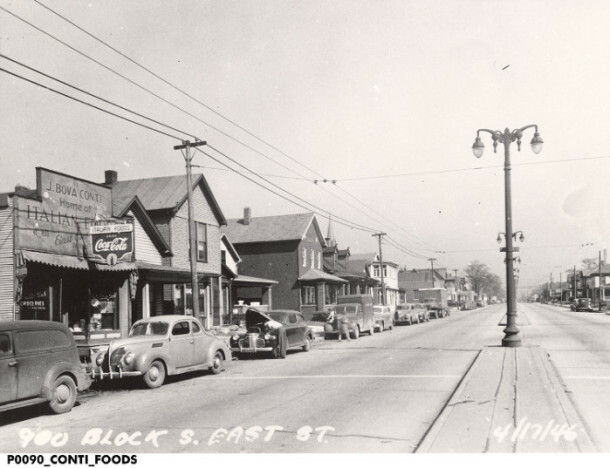 Looking north at the 900 block of S. East Street, April 1946. 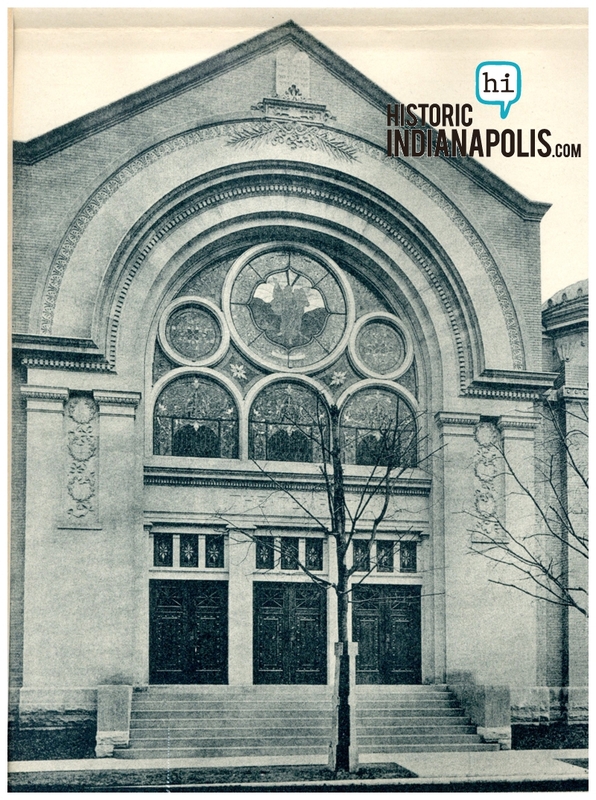 Courtesy of the Indiana Historical Society, Italian American Collection. The era of locally-owned corner grocery stores slowly disappeared by the mid 1900s as national chains such as Kroger and A&P dominated and large supermarkets sprang up in the suburbs. The old Bova Conti grocery store building was demolished between 1962 and 1972 to make way for landscaping and parking for Eli Lilly and Company. Some of the flavor of the old neighborhood is visible across the street, where The Bosphorus Turkish restaurant occupies a converted old house adjacent to the Hookah House in an old corner commercial building. As I visit other cities I seek out funky old areas with mixed-use neighborhoods. Lately we’ve come to appreciate what worked well in the past. Popular concepts among urban planners and folks who care about improving Indianapolis and other cities include walkable neighborhoods that are close to shops and other amenities, relaxed parking requirements (especially as public transportation improves), and live-work or home-based businesses (which is how Conti lived for decades). Here’s hoping that a new model evolves that encourages the return of the corner store. Very interesting article! 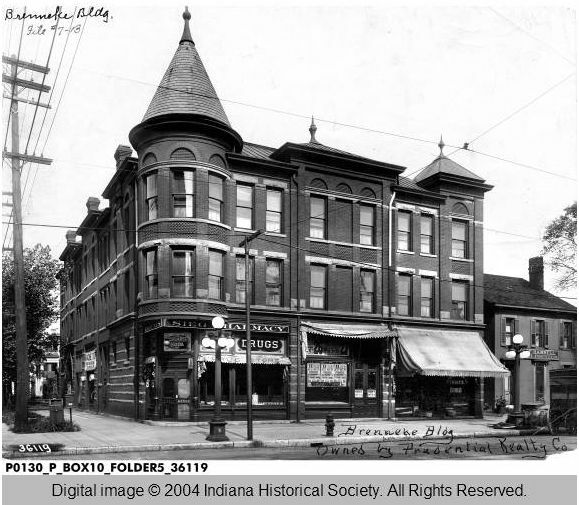 I am curious if the Bovaconti Jewelers in Fountain Square are possibly descendants of the grocer John Bova Conti. Corner stores had more to do with the lack of automobiles. Yes, America used to be dotted with neighborhood stores that one could walk to, or take the streetcar to. Mom didn’t have a car. And possibly, neither did Dad. The modern “convenience store” or “gas station plus really expensive groceries and cigarettes” type- places continue to be available in really poor neighborhoods. Black, white, Hispanic; you’ll find them! I know I’m getting a little off topic here, but money and transportation choices certainly affect this type of retail development, historic or otherwise. Hang out at a convenience store in a poor neighborhood anywhere and you’ll think that the Hoosier Lottery is the biggest deal in the world! 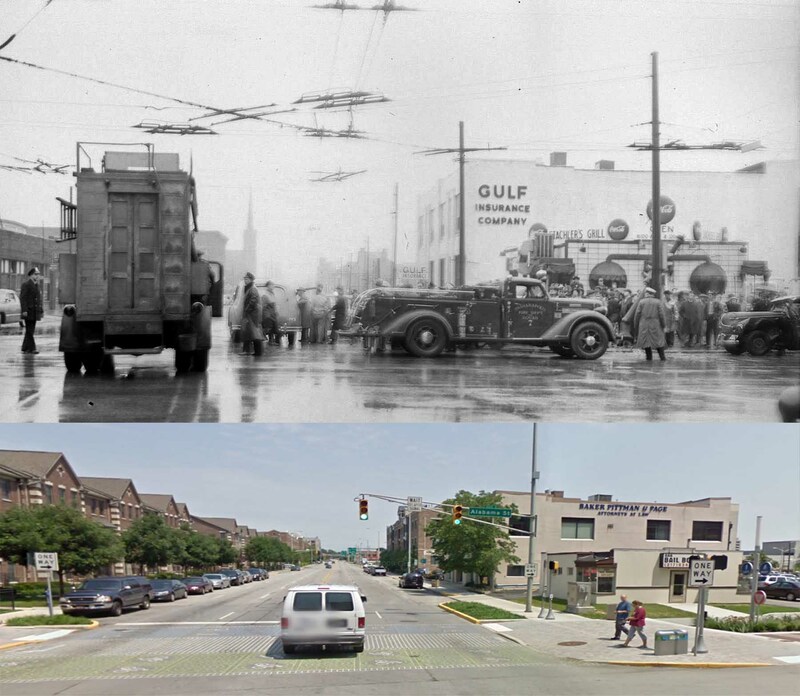 Regarding streetcars: In the last 1946 photo showing South East Street, the electric wires for the street cars seem to still be in place overhead, but the tracks don’t seem to be visible in the street anymore. Perhaps this was that small era where the city ran electric busses that drew power from overhead lines? Many Indianapolis streets today still have the old streetcar tracks under the asphalt pavement, occasionally peeking through. Two items — what relation might these folks have been to those who ran the Bova wholesale fruit and vegetble business at a terminal on Mass. Ave. east of Sherman? That terminal no longer stands. Second, many mom and pop groceries would have a bread box outside for early delivery of fresh bread. One I remember was in front of a grocery [no longer there] at the main intersection in Hortonville between Westfield and Sheridan in Hamilton Co. It had the name of West’s _____________ on it — and West’s bakery was later owned by the late Steve West, former city council member, Indpls. His daughter Emily still runs the operation and a charity spun off. The last I knew West Baking had a principal customer in McDonald’s to make buns. Remember doing banking business at the Indiana National Bank Produce Terminal branch, as this branch, as this branch was the closest INB branch to our neighborhood at 21st and Emerson…(in history, the old fomer Brightwood Airport, a small private field, was located there before, just eastward of the Interstate Foundries. I heard from an older East Side gentleman that Amelia Earhart flew from this small strip once upon a time). Norm, I didn’t have time this week to dig very deep into the family history, but I hope some family members will answer your question. I can add that John Bova Conti came to the US in 1902 from Palermo. According the Divita, he and his brothers made liqueurs and cordials (in Italy? ), before he got into the grocery business with Mrs. Mascari. Sometimes he is in directories under Bova, and other times under Conti. He does not appear on a family tree chart in ancestry.com, but I found several newspaper articles about him. Love this article, Joan! There was an area in Ben Davis when I was a kid (early to mid-1950s) that had a grouping of Mom & Pop stores at the intersection of W. Washington St and High School Rd. Many of those stores had living space in the back. I really hated to see them disappear! The story is accurate, but failed to mention that the Mascari family ran the store after J Bovaconti, from the late 30’s until the late 50’s. I know, it was my grandparents, Tom & Marie Mascari. I remember visiting the store as a child. Thanks, Gus! I was hoping that family members would speak up. I didn’t have time to check my city directories to find out when the store closed. I will update the story (that is the good thing about writing blogs). Maybe you can answer Shari’s question: are the owners of Bovaconti Jewelers in Fountain Square related? I know they display copies of many Italian-related stores and people from Indianapolis. 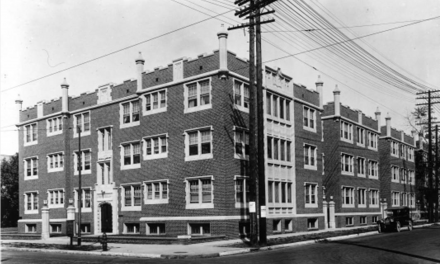 Both, Bova and Mascari families are still striving on the south side. I love reading about side side of Indianapolis history even though I was raised on another state. Relative to the Mascari family, I met a gentleman whose last name was Mascari (at a meeting) who was in management of street repair and maintenance for the City of Indianapolis in 1968, and was quite versed on this subject. Also, remember the Caito family had a facility at the Indianapolis Produce Terminal. Are they connected to these other two produce families? Grew up with some of the Bova family on the southside. There was an elderly Mr Bova who used to come into the White Castle on the strip for very early morning coffee. We loved him. Basil, that would be John Mascari, he was one of the Mascari twins (identical brother Mike), They both hold or held track records at Manual HS. Tom, the son of Josephine, married Marie Laschavio. They owned and ran the store until the late 50’s. They had 11 children, 10 boys and 1 girl, lived 2 doors up from the store. Three of the siblings are still with us and doing well. There are many stories, rumors and presumably legends surrounding the store, including Al Capone making frequent visits to the store when in Indianapolis. Many of the old timers that remember it will talk about my grandmothers homemade fresh bread she would make from Thursday thru Sunday of the week and how it was the best Italian bread anywhere. People would travel from all over central Indiana to buy bread, pasta and Italian meats. Giovanni Bova Conti was a nephew of my Grandfather Pasquale Bova Conti who came to USA with family in 1900. Pasquale had come to the US also in 1892 and 1898 before returning with his wife Angela and three younger children. My eldest Uncle, Bartolomeo Bova Conti remembers traveling in Texas, Oklahoma and Indianapolis with his father ( and I presume other friends or relatives ) looking at places to open a business. They finally settled in Boston and also ran an Italian Store on Columbus Ave and then on Huntington Ave near the present Boston Public Library. I do have a picture of Giovanni ( John Bova Conti ) that he sent to his uncle ( my Grandfather Pasquale ) and he looks like a rather robust man sporting a racoon type coat from the 1920’s. I wonder if the names Agostino or Marianna Bova Conti have any connection to your family. Marianna was my 2nd great-grandmother and Agostino was her brother. She arrived in the States in 1900 with my 2nd great-father Filippo Russo. The ship manifest indicated that they were coming to see Marianna’s brother Agostino in Lawrence, MA. Sorry for my delayed response……off the top of my memory these names don,t appear in my Bova Conti family……I will check some notes I made back in 1969 when I first visited Sicily……I do know that my eldest Uncle Bartolomeo (June 18, 1883 – June 11, 1970 ) remembers visiting the Chicago Worlds Fair as they travelled north from TX and Oklahoma…..my guess is there must have been family members in Indianapolis or Chicago before they settled in Boston in the late 1890s…..My Grandmother and three of her children came to Boston ( via Ellis Island ) with my Grandfather Pasquale in 1900…..records indicate they were to live with their two oldest sons Bartolomeo & Francesco……my guess is on first trip to USA Bartolomeo came with his father and on second trip to USA Francesco came and then in 1900 the rest of family……..I do not know of any other family members other than Giovanni ( John from Indianapolis ) who might of came to USA…….hope this may be of assistance……. I didnt realize you had responded until today. This may remain a mystery. I appear to be the sole genealogist/family historian for this branch. My grandfather passed away 2 years ago and often clammed up when I brought up anything about his father’s side of the family. If I find anything, I will share.